Submitted by Alexander Briones on Sep. 25, 2018. First published on February. 17, 2016 and last updated on September 25, 2018 by Alexander Briones with additional research and writing by Denise Azucena & Jason Horton. 49 Key controllers hit the sweet spot for many musicians and music producers with their four octave set of keys. They are more playable than their smaller 25-Key siblings, yet still compact enough to be mobile, and to not take up too much space in a home recording studio. Here we take an updated look at the best of these 49 Key MIDI controller keyboards, taking into consideration the latest reviews and ratings up to the third quarter of 2018. If you're looking for something larger, then take a look at our 61-Key or 88-Key MIDI Controller guides. What Do You Want To Control? If you only want to control computer software then all of the options below will do that, although some offer more control options than others. If you want to control external hardware, such as a stand alone synth, then you'll need to get one that explicitly says it will do that - most of the ones that come with a 5-pin MIDI out port do that and we tell you below on each description whether or not it meets that need. Software Integration. Most of the MIDI keyboards we recommend below come with presets or automatic configuration options that make it easy to integrate with most major DAWs - sometimes you have to download some extra files from the manufactures website to do that. I've tried to indicate which major applications each keyboard integrates well with, but if you're unsure then feel free to ask about your particular software and the particular controller you're interested in and I or someone else here will advise you. Transport Controls. These are dedicated buttons to control standard DAW recording controls such as Play, Stop, Rewind, Fast Forward etc. They can be a very handy feature because you can keep your recording workflow going without having to reach for your computer mouse. Motorized Controls. These are seriously cool, but usually only found on larger than 49 key controllers, but the Nektar Panorama P4 below does have this feature. Key Size & Weight. Some 49-key controllers have full sized keys but some don't. Many also don't have piano style full weighted keys with 'synth action' keys being the most popular. If you're a piano player and you need piano style keys then read the specifications carefully. Power Supply. If you need one for portable use with a laptop or tablet then you need one that uses batteries or takes its power from USB, however USB power comes at the cost of draining your device's battery more quickly. You also may have problems getting enough power from the iPad which only provides 100mA instead of the USB 2.0 standard of 500mA. If you have a problem getting enough power from an iPad you'll need to get a powered USB hub or use a power adapter to supply the keyboard directly. The Impact GX49 is a light-weight and compact controller that has Nektar's DAW Integration feature, making it compatible with most major DAWs. With its dedicated set of transport and navigation controls, this controller lets you efficiently produce music without reaching for your computer mouse or keyboard. The class compliant feature allows this controller to connect to any computer system or device. Both users and experts found the the keys to be responsive and have a rigid feel. In his MusicRadar review, Dan Goldman said the keyboard had "a nicely deep key travel and the well-balanced springy feel facilitates fast accurate playing, both for synth lines and sounds that normally demand a weighted action". Most reviewers gave positive responses for its ease of use since it provided the essential controls they needed in a controller. This is a great choice for beginners and keyboardists on a budget. The Korg microKEY Air 49-Key controller is a streamlined portable keyboard controller designed for Apple's popular laptops and iOS mobile device. It does away with extra features and sticks to keyboard essentials, which include a compact 49-Key mini keybed with velocity sensitivity, along with useful keyboard controls that include pitch wheel, mod wheel and octave selection buttons. To make this keyboard even more convenient, Korg designed it to run on USB power or on two AA batteries which can last for up to 30 hours of use. Finally it can conveniently lets you connect to wirelessly via Bluetooth technology. Keys: 49 Mini Key with velocity sensitivity. Power: USB powered or 2 x AA. Compatibility: Mac OS X, iOS via CCK. Dimensions: 27.91" x 5.47" x 2.13"
Low latency control gets the most positive mentions in reviews, with some noting that it has good enough latency for live performance use. Speaking of performance, there are also a good number of users who appreciate the natural feel and compact size of the keys. Finally, it gets a lot of thumbs up for how Korg was able to fit a four octave keybed into a compact unit. Some users are concerned about the plastic housing of the controller, but this should be expected given its price range and its focus on portability. If you're looking for a good 49-Key MIDI keyboard controller that's compatible with iOS devices, then the Korg microKEY AIR 49 is highly recommended. 85 out of 100. Incorporating 100+ ratings and reviews. The Roland A-49 has achieved high enough ratings to continue to be recommended by us for a third year in a row. If you want a 49 key MIDI controller for your iPad then the Roland A-49 is a good choice because it shouldn't need additional USB power to work with the iPad because it only draws 98 mA. Its unique feature is the D-BEAM controller which lets you wave your hand above it to send control data. Keys: 49 with velocity sensitivity. Octaves: Up and Down buttons. Bundled Software: Cakewalk SONAR LE - only for Windows. Connectivity: USB, 5-Pin MIDI, and 2 x TRS input for an expression and a sustain pedal. Compatibility: Mac OS X and Windows. Also iOS via CCK. Dimensions: 32.91" x 7.17" x 3.31"
Although it only has 2 knobs and 2 switches in addition to the D-BEAM controller, this actually came up as a positive in reviews by those who want a simple, straight forward, keyboard controller without a lot of confusing functions. In general it received positive reviews from people who appreciate Roland's build quality - particularly with the keys. This will suit you if you primarily want a simple yet effective MIDI input device, rather than a full featured DAW controller. 86 out of 100. Incorporating 250+ ratings and reviews. The Launchkey 49 Mk2 is a plug and play controller designed for producing and performing electronic music. It features faders, knobs, keys and velocity-sensitive RGB pads that give complete control over Ableton's audio and MIDI functions. Apart from its compatibility with Ableton, it automatically maps to other major music making applications & DAWs. Dimensions: 30.51" x 10.63" x 3.54"
This controller was able to impress a lot of users with its solid and robust faders, knobs and keys. The keys provide enough pressure sensitivity and responsiveness to make it good for composing or performing. Many users mentioned that it works very well with Ableton and Novation apps. There were reports that there had been no issues with the controller integrating with many user's computer systems. Its compact and minimal design makes it easy for them to figure out controls effortlessly. A minor issue some users mentioned were its pads had a lack of sensitivity, though they are still useful when it comes to triggering samples and tracks. This is a great choice if you want a sturdy keyboard controller that's easy to use. 85 out of 100. Incorporating 275+ ratings and reviews. This is another controller which we first recommended in February 2016 and which has increased its Gearank score since then and retained its place as one of the highest rated options currently available. One aspect I quite like about the Novation Impulse are the transport controls - it has dedicated buttons for play, stop, record, rewind, fast forward and a loop toggle switch. Another nice feature is that when you put it into arpeggio mode, you use the keyboard as usual but you can also use the pads to turn notes off and on and change the rhythm of the arpeggio. Keys: 49 full size, square front, semi-weighted with aftertouch. Pads: 16 velocity sensitive with RGB illumination. Bundled Software: Ableton Live Lite and Xpand!2 by AIR Music Tech. Power: USB or optional separate power supply. Connectivity: USB, 5-pin MIDI out, 1 x TRS input for sustain pedal. Compatibility: Mac OS X 10.8 or later + Windows 10, 8, and 7. Dimensions: 28.3" x 15.1" x 6.29"
Its Automap software makes it easy to set up with Ableton Live, Logic Pro, Sonar, Reason, Pro Tools and a range of other major music applications. Both customer and expert reviews say this is a very good tool for composing and recording. They consistently talk about how good the pads and keys are. On the downside a few people report that the faders feel a bit cheap, but I didn't see anyone saying the faders had broken - and a few like that it has 9 instead of the usual 8 faders. There were also a few people who found the Automap software difficult to get used to at first. Overall it has a lot of features for the price and would happily be used as your main MIDI controller in a home studio. Akai Professional are a stand-out leader in MIDI controller keyboards with the smaller MPK225 also retaining its place as one of our recommended MIDI controllers for the third year in a row. The MPK249 lets you control DAWs with presets for most major software, virtual instruments, effects plugins and other external hardware. Keys: 49 full size semi-weighted with aftertouch. Pads: 16 which are velocity and pressure sensitive and they light up MPC style (with full RGB) - there are also 4 Pad banks giving you 64 inputs. Power: USB powered and can use an optional power adapter (sold separately). Connectivity: USB and 5-pin MIDI out and MIDI in, 2 x TRS inputs for expression pedal and sustain pedal or footswitch input. Compatibility: Mac OS X 10.4.11 or later + Windows 10, 8, 7, Vista, and XP, also iOS compatible via CCK. Owners praise it for how easily it integrates with major DAWs and for the quality and sensitivity of the Pads. They also speak very highly of the MPC features which shouldn't surprise anyone given that it's made by the same company. Expert reviewers are in complete agreement with most of the customer reviews - they rate the functionality and performance very highly. People used to complain about the faders, pads and knobs on the previous version, but those who make the comparison are uniform in stating that those are all now top quality in this version. In fact it's very hard to find negative reviews of any kind. The only complaints I found when reading all the reviews was one person who said he wished the knobs were lit for playing live in the dark, and another who said they wanted a PC configuration editor like the 25-Key Mini MkII has. 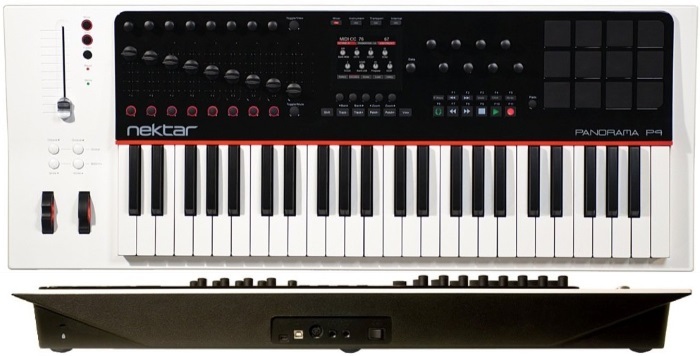 Overall, the MPK249 is still a highly regarded 49 Key controller. Although the Panorama P4 can be used as a general MIDI controller, it has been specifically designed for use with Cubase, Bitwig Studio, Nuendo, Logic Pro, Apple MainStage, Reaper and Reason. In particular it has a channel strip control with a 100mm motorized touch sensitive fader above the 2 mod wheels which responds to the volume of the selected track in your DAW - select a different track and the fader will automatically move into the correct position. It also gives you access to EQ, sends and inserts. Keys: 49 semi-weighted, velocity sensitive with aftertouch. Pads: 12 which are velocity and pressure sensitive - you can set 7 velocity curves. You can set up to 20 pad maps and you can transpose and octave shift them. Power: One USB port will power everything except the motorized fader - you need an additional external USB Micro B power supply port to power all features. Connectivity: USB & USB Micro B, 5-pin MIDI out, 2 x TRS inputs for expression pedal and sustain pedal or footswitch input. Compatibility: Mac OS X 10.6 or later + Windows 10, 8, 7 and Vista. Dimensions: 35.04" x 14.57" x 5.51"
The 3.5” high resolution TFT screen provides a real time view of all the controls and functions you are currently accessing on your DAW. A thoughtful feature is that it also works as a MIDI interface - you can send MIDI data from your DAW through the P4 to control other MIDI hardware. You can also plug the P4 directly into other MIDI hardware such as synths and control them directly without a computer. The most often positively cited feature in reviews is the deep level of integration with the major DAWs listed above - customer reviews often use the adjective "amazing"! On the negative side, users of other DAWs not listed above were generally disappointed that the P4 is not deeply integrated with them - Pro Tools users seemed especially miffed. Overall, if you have one of the listed DAWs above, then you'll find the Panorama P4 will improve your work flow immensely. Our selection criteria included all controllers that are widely available from major US-based music equipment retailers, this is to ensure we only recommend items that you can readily buy online or at any good local music gear stores. For this update, we began by updating the Gearank scores of all the 49 key MIDI controllers in our Music Gear Database to better reflect the most current market sentiments, then we looked to see which newer keyboards we should add to our short-list for consideration. During this procedure we collected information from over 2,400 online ratings, discussions and reviews, all of which were processed by the Gearank Algorithm to produce scores out of 100 for each controller. We then used the scores to feature only the best of the best in this guide. As always, if there is a controller that you feel we should consider adding to this guide, and it's not already in our database, then please let us know in the comments below. For more information about how we select items for our guides, please see How Gearank Works. Submitted by William M (not verified) on May. 1, 2016. Thanks for this excellent comparison summary. Really helpful. If you decide to do an update, a couple of other items that impact my buying considerations are whether the keyboard has a port for an expression pedal, and also the weight of the keyboard for those of us who are looking for portability. Also curious what you think of the m-audio ctrl-49 when it comes out soon. Submitted by Jason Horton on May. 2, 2016. I will put it on my to do list to add information about pedal ports and keyboard weights. All I know about the M-Audio CTRL-49 is what I've read about it and some videos from NAMM - it certainly looks good and packed with features and I'll be looking forward to seeing how well it is received when it finally hits the stores. Submitted by Caleb (not verified) on Feb. 14, 2017. Submitted by Jeff (not verified) on Mar. 3, 2017. This is incorrect. You can control VSTs that are on you computer using VIP on the CTRL49. It does not play the VSTs as a standalone. Weights have now been added as requested. Submitted by jagc (not verified) on Jul. 13, 2016. Hi, thanks for making this comparison review article. I know this is a "best" list according to your own statistics, but I'm very much surprised that the 2 midi controllers I'm comparing to buy one or the other right now are not in your list. In my research, most "best" list from other sites includes "M-audio Code" and "Novation Launchkey MkII". Launchkey is even number 1 from those other sites too. I'm very much curious why these 49 key midi controllers aren't in your list. Because if I'm convinced enough, i will buy the "Akai Professional MPK249" as that is very easy to reach right now. Submitted by Jason Horton on Jul. 13, 2016. Thank you for asking that question because it made me ask myself the same question about the Novation Launchkey 49 Mk2. To find the answer I have reprocessed the Gearank scores with fresh data for all 16 of the 49 Key keyboard controllers in our database. The Novation Launchkey 49 Mk2 has increased it's Gearank score to 86 which means that we can now recommend it. On the other hand, the M-Audio Code 49 remains one of the lowest rated 49 key controllers, with a current Gearank score of only 76, so it still hasn't earned it's way into a list of controllers we would recommend. I have updated the list of Key features for each keyboard above to include their physical dimensions - this is useful information for deciding which keyboard stand to get. Submitted by Alper (not verified) on Feb. 13, 2019. Korg Taktile 49 is also good controller. Submitted by Jason Horton on Feb. 14, 2019. Unfortunately it's no longer available from most retailers so you pretty much have to buy it second hand these days.